Enjoy Your Journey In Christ, In Time! You have been placed IN TIME for such a time as this. Reality. You are here in time, now. We tend to look back on the past and get stuck in the present with regret or fears from the past. Or we keep looking at what we hope is in front of us in the future to escape our present or past and we fail to see the NOW. Sometimes we just have to enjoy the journey! We don’t always have to look at where we’ve been and analyze it in introspection. But neither do we have to always look ahead, trying to avoid our current situation. Again, enjoy the journey! I know, I know – I hear you saying, “It’s not so easy!” Actually it is when you release your expectations of your life in time to God. I am trying to help you to see a revelation of your position in Christ and in seeing that, live from that perspective in the here and now. Each day of your life, you interact with TIME that is always moving forward, whether you like it or not. You can choose to enter its flow and let it take you where it wants to take you OR you can live your life in union with Christ, by the Spirit. In Christ, He sets the path as the way, the truth and the life. The reality of keeping an eternal perspective in time helps us to see that not only our life, but also our time has been redeemed in Christ. You do not wander in time, aimlessly meandering as if in a nebulous cloud. BUT, neither are you called to be driven into an endless quest for perfection that constantly evades you. You will never answer all the questions in your heart that weigh you down in anxiety and worry. So why not change your perspective and enjoy your journey in Christ. Ephesians tells us we are seated in heavenly places so we are there. Yet look around, you are also here. Boggles the mind to even try to analyze or dissect it. You are already there in eternity. You are here in Time. Eph. 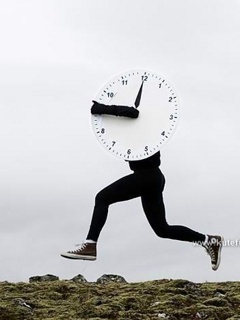 5:15 See then that you walk circumspectly, not as fools but as wise, 16 redeeming the time, because the days are evil. What’s this actually saying and how does it help me get through my days in time? Well let me paraphrase it based upon having looked up the meanings of some of the words in this verse. Here goes. These days are chaotic and frenzied. Open your spiritual eyes to see that you are on a path in Christ. Seeing that your path is not random or haphazard begin to walk with diligence and accuracy, knowing that the Way, the Truth and the Life lays the path in time for YOU. How do you walk this way? You walk in the reality of the finished work of the cross. He reveals Himself to you, with each step. You are in Him. Walk in Him. Move in Him. Have your being in Him and with each step in faith in this reality, purpose and destiny are inevitable. It’s a done deal worked out and working itself out with each step. Be sure footed and know that He who leads you along this path of life, will teach your feet to be sure-footed and accurate and secure in all things no matter where this path takes you. He is in you and with you. Your time here and now has been redeemed so you walk contrary to the demands of the world at large. You are a new creation in your salvation so walk in this reality. You have been redeemed and set free and in time, you walk in this journey with a focus on the One who is walking with you. This time is limited. It goes so fast so make sure that you grasp every opportunity. There is nothing wasted. No sickness, no disease, no financial distress, no worry, no fear, anxiety that is greater than Jesus Christ– none of this can take you prisoner if you realize that in time, God works all things for good. All things.